Do you want to learn how to draw cars like a real artist or car designer? 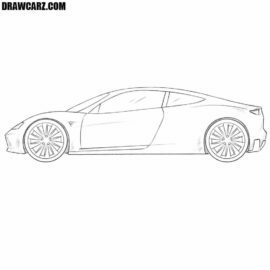 Well, the team of DrawCarz.com will help you to improve your skills in drawing cars. But cars are different and when a person asks a question about how to draw a car with a pencil, there is a counter-question – what kind of car do you want to draw? Supercar or truck, pickup or minivan, Mercedes or BMW and etc. Our site has collected a huge number of drawing guides on this topic. We have as basic drawing guides (how to draw a realistic car), and more specific, about how to draw certain brands and certain brands. Perhaps looking at realistic and voluminous drawings of cars, you might think that you will never draw in the same way. Believe me, it’s not that as difficult. The main thing – step by step follow the advice and instructions that you will find in our site. All our articles are divided into many very simple steps, consisting of simple actions, so that none of our readers have any problems in the process of sketching. 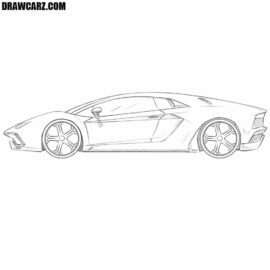 Our site is constantly updated, and every week new drawing lessons appear here. We try to keep proportionality in everything, and therefore we try to evenly publish simple and complex step by step guides. To simplify the search among our tutorials, we have created several categories, divided according to body types. As you can see, we tried to do everything to make the learning process not only simple, but also fascinating. The young artist will be able to proudly demonstrate his car collection to friends and family, and in addition, he will get an idea of such important concepts in art as form, proportion, spatial image, will master basic technique of drawing. A more experienced artist will be able to raise his skills of drawing to an unprecedented level, and draw even better than before. DrawCarz.com will help to master all stages of the drawing, from the very beginning to the finished work, and you will quickly learn how to draw cars.